DeAndre Hopkins displayed his apparent dissatisfaction with the Texans known last week by staging a brief holdout, but the team is not discussing a new contract with the talented wideout. Rick Smith said, via James Palmer of NFL.com (Twitter link), no negotiations between Houston and Hopkins are transpiring right now. The 24-year-old wideout, who is coming off back-to-back 1,200-plus-yard seasons, said on an NFL Network interview (via Ian Rapoport of NFL.com, on Twitter) he’s not stewing over his contract situation. “It’s not something I sit here and think about. … What goes on off the field works itself out,” Hopkins said during the interview. Owner Bob McNair said previously that the fourth-year receiver’s contract was going to come up in due time. Hopkins is set to make $1.5MM this season. Houston exercised Hopkins’ fifth-year option, putting him on their 2017 books for $7.915MM. As of now, that figure would rank 20th among wideouts in terms of ’17 earnings. Regarding Hopkins’ situation, which isn’t unique in today’s NFL, Mike Florio of Pro Football Talk notes the 2011 CBA overcorrected the previous problem of underperforming rookies anchoring payrolls. In allowing teams to wait a minimum of three seasons before giving deserving rookies raises, Florio notes the league not instituting a device that would ensure non-busts received their due earnings penalizes the players who do reward teams by outperforming their contracts. Here’s more from the AFC on preseason eve. Clark Hunt told media (including Terez Paylor of the Kansas City Star) Eric Fisher‘s contract negotiations spanned barely two weeks in late July leading up to training camp. The Chiefs signed the scrutinized left tackle to a four-year, $48MM extension. Hunt envisions the Chiefs revisiting Eric Berry‘s contract after the season. The franchise’s chairman echoed the reports that said the Chiefs and the All-Pro safety were too far apart on terms by July 15. “As soon as we have an opportunity next year, we’ll sit down with his representatives and see if we can work out a scenario where he could finish his career here. … We couldn’t close the gap this year, but next year’s a different situation,” Hunt said. “I can’t say that there will be anything fundamentally that happens that would make it possible, but it’s certainly something that we’ll talk about.” Berry will make $10.86MM this year as part of the franchise tag, one the 27-year-old talent has not signed and is not expected to for a while. As he said in an interview with PFR’s Zach Links, ESPN.com’s Adam Teicher does not foresee Berry being in the Chiefs’ long-term plans. The ESPN.com writer noted that simply a year passing and the sides being back at the negotiating table doesn’t mean either will compromise. Berry stands to be one of the most pursued free agents after this season, should the seventh-year safety reach the open market for the first time. The Chiefs are projected to possess just $6.7MM in cap space in ’17, and Dontari Poe will also be a free agent. The Bills will work out free agent linebackers on Sunday after Rex Ryan backtracked on his statement saying Reggie Ragland likely avoided ligament damage after suffering a knee injury Friday, Mike Rodak of ESPN.com reports. Ryan said the team is “definitely concerned” about Ragland’s knee, via Joe Buscaglia of WKBW (on Twitter). Buffalo’s second-round pick sustained the injury in a non-contact situation. The team is already expected to be without first-round pick Shaq Lawson for multiple games. The Steelers are involved in multiple contract negotiations, with David DeCastro joining Antonio Brown as players with whom management is discussing deals. The Chiefs and fourth-year starter Eric Fisher have agreed to a four-year extension, as Adam Schefter of ESPN.com reports (on Twitter). It’s a four-year, $48MM deal, Rand Getlin of NFL.com tweets. The contract includes $22MM guaranteed at signing, features a new-money average of $12MM per year, and will pay out $28.5MM by March of 2017. Kansas City recently exercised Fisher’s fifth-year option worth $11.9MM. The former No. 1 overall pick was set to earn $3.4MM this season. He’ll now be one of the highest-paid tackles in football, and the Chiefs have their starting tackles — Fisher and recently acquired Mitchell Schwartz — locked up through the rest of the decade. However, this deal looks somewhat surprising due to the nature of the commitment. Fisher will now become one of the highest-paid left tackles in football on a per-year basis. Fisher’s deal looks to place him firmly within the top-five commitments at the position, with Tyron Smith and Cordy Glenn also earning $12MM per year. Trent Williams and Terron Armstead reside as the league’s previous $13MM-per-year tackles, with the former’s $13.2MM AAV representing the previous high. In terms of guarantees, Fisher did extremely well. Armstead received $20.8MM guaranteed at signing and $38MM in total guarantees. Fisher and Lane Johnson are the only 2013 first-rounders to be extended yet, Joel Corry of CBSSports.com points out (via Twitter). Fisher is coming off his best season as a pro, but few consider him to be among the league’s best tackles. He began the year out of the starting lineup after suffering a high-ankle sprain during the preseason and was briefly relocated to right tackle as the underwhelming and since-departed Donald Stephenson was slotted on the left side the Chiefs drafted Fisher to play. Although Fisher eventually resumed play on the left side and became a key presence during the Chiefs’ 10-game win streak, Pro Football Focus graded the 6-foot-7 blocker as its No. 36 overall tackle. That assessment is by far the kindest the analytics site has been to the lineman, one who began his career at right tackle in 2013 before Branden Albert departed before moving to the left side a year later and not being particularly effective. But Saturday’s announcement on the first day of training camp shows the organization’s faith in Fisher’s potential despite his talents being questioned by many. From a macro perspective, the Chiefs continued their massive investment in their current core. Despite failing to hammer out a contract with franchise-tagged cog Eric Berry earlier this month, Kansas City entered Saturday with barely $4MM in projected cap room next season. The Chiefs re-signed several players this offseason and gave Travis Kelce a top-market extension. That comes after extending Alex Smith and Justin Houston. As a result of these commitments, Kansas City stands to have almost no cap space in ’17 and few avenues to create much more. Berry and Dontari Poe are the only members of the Chiefs’ nucleus without long-term deals. GM John Dorsey previously said Berry remains firmly in the Chiefs’ plans. On the heels of his six-interception 2015 campaign, third-year cornerback Marcus Williams could be the Jets’ most underrated player, opines Brian Costello of the New York Post. The former undrafted free agent from North Dakota State and ex-Texans practice squad member showed off impressive ball-hawking prowess last season despite serving as a fourth corner and playing just 27 percent of the Jets’ defensive snaps, and he’ll spend the next couple months battling Buster Skrine for a starting job opposite Darrelle Revis. As a contract-year player, Williams stands to earn a significant raise over his $600K salary by next offseason if he proves capable of filling a bigger role – whether as a starter or slot corner – in 2016. There’s a chance Dallas Thomas will beat out first-round pick Laremy Tunsil as the Dolphins’ starting left guard, which would be a nightmare for the team’s fans, writes Barry Jackson of the Miami Herald. Thomas – whom Pro Football Focus ranked as the league’s second-worst guard among 81 qualifiers last season – seems to be ahead of Tunsil in the pecking order after the rookie struggled in minicamp, per Jackson. Tunsil, the 13th overall pick, was a dominant left tackle at Ole Miss and acknowledged that it’s not easy to learn a new position and playbook. 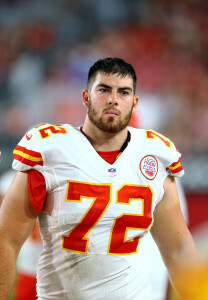 Chiefs offensive tackle Eric Fisher, the No. 1 overall selection in the 2013 draft, sees himself “on a steady incline” after transitioning back to the left side midway through last season, he told BJ Kissel of the team’s website. Fisher, whose pro career hasn’t lived up to his draft status, added that his impressive performance against the J.J. Watt-led Texans in the Chiefs’ 30-0 wild-card round victory “almost seemed like a little bit of a turning point in my career.” Having picked up Fisher’s $11.902 fifth-year option for 2017 in early May, the Chiefs are also clearly encouraged by the progress he made last season. That option is guaranteed for injury only, though, so if Fisher stays healthy and fares poorly this year, Kansas City will have the opportunity to reverse course. Broncos general manager John Elway‘s competitiveness could be a roadblock in the way of a Von Miller deal, according to Mark Kiszla of the Denver Post. Kiszla wonders if the Hall of Fame quarterback can put aside his hatred of losing to reach a compromise with Miller, the franchise-tagged linebacker who’s fighting with the Broncos over the lack of guaranteed money in their six-year, $114.5MM offer. The two sides have until July 15 to reach an agreement; if that doesn’t happen, the reigning Super Bowl MVP’s only choices would be to sign the $14MM-plus franchise tender or continue sitting out. The Chiefs are the latest team to officially announce that they’ve exercised a fifth-year option on a 2013 first-rounder. In Kansas City’s case, that player is former No. 1 overall pick, Eric Fisher. The Chiefs formally confirmed (via Twitter) that they’ve exercised the veteran tackle’s 2017 option. Fisher, 25, has been a starter for the Chiefs – first at right tackle and then at left tackle – since being selected first overall in the 2013 draft. Although his first two years were somewhat underwhelming, he showed signs of improvement in 2015, particularly down the stretch. His performance was enough to convince the Chiefs to exercise his option for 2017, which will put him in line for a $11.902MM salary. Of course, for now, that option is only guaranteed for injury, so as long as Fisher stays healthy in 2016, Kansas City’s real decision will happen next March — on the first day of the 2017 league year, Fisher’s $11.902MM salary would become fully guaranteed. Fisher had been one of two offensive tackles at the top of the 2013 draft whose fifth-year option for 2017 wasn’t necessarily a slam dunk. The Jaguars have yet to announce a decision on the No. 2 overall pick from that draft, tackle Luke Joeckel. The full list of fifth-year option decisions for 2017 can be found right here. With the deadline for picking up fifth-year options on 2013 first-round picks more than a month away, the Chiefs are taking a proactive approach. They’ve discussed an extension with Eric Fisher, the No. 1 overall pick in that year’s draft, according to B.J. Kissel of Chiefs.com (on Twitter). The Chiefs have until May 2 to decide whether or not to pick up the 2017 option for their left tackle, and John Dorsey has participated in talks with Fisher’s representatives about possibly prolonging Fisher’s stay in Kansas City. Much like Luke Joeckel, whose fifth-year option doesn’t look like it will be exercised in Jacksonville, Fisher hasn’t lived up to his draft slot. His case for a fifth year in Kansas City isn’t as simple as Dontari Poe‘s was last year. Having shown scant semblance of upper-echelon performance at either right or left tackle, Fisher could be due close to $12MM on a fifth-year option, with precise figures for the 2013 class having not been released yet. The Vikings are currently in this position with Matt Kalil, the No. 4 overall pick in 2012 who is set to make $11.09MM this season — the third-highest cap figure for left tackles in the league. An extension would be a way of getting around that price tag while establishing some continuity to an offensive line that’s had little during the mid-2010s. The Chiefs have lost Geoff Schwartz, Branden Albert, Jon Asamoah, Rodney Hudson, Jeff Allen and Donald Stephenson from their front since March 2014. Fisher did improve last season and finish as Pro Football Focus’ No. 37-ranked tackle despite a sprained ankle slowing him down to start the season. The Chiefs relocated Fisher to right tackle in favor of the now-departed Stephenson but soon shuttled him back to the left side once Stephenson failed to deliver. Although the Chiefs re-signed swing player Jah Reid last year and gave Mitchell Schwartz a hefty contract on Day 1 of 2016’s free agency period, they don’t have an obvious replacement for Fisher on the roster. And although it’s early, the Chiefs possess the fourth-fewest projected cap space for 2017, according to OverTheCap, at just more than $24MM after re-signing several players this offseason. Kansas City re-signed Derrick Johnson, Tamba Hali and Jaye Howard earlier this month after giving Travis Kelce an extension shortly after the season ended.